Are planting and transplanting on your fall garden task list? What about fertilizing your lawn, flower beds, or plants? As part of our Fall Garden Tasks Podcast Series, this episode is full of fall garden planting and transplanting tips for your fall garden! Planting and transplanting are garden maintenance tasks that are necessary for your garden's health. Fertilizing is a maintenance task that can take place any time of year, but fall is a great time. We have tips for you to make your fertilizing tasks more efficient and help keep your garden healthy. By the end of this episode, you will know how to get your plants properly planted and how to fertilize your garden plants so they are ready for the winter months!! This episode is for those of you newbies to more advanced gardeners who need help with general planting, transplanting and fertilizing maintenance tasks. Stay tuned for our next episode of the Fall Garden Tasks Series, Ep. 27: Fall Equipment Maintenance! Ep. 26 is part 5 of our 7-part podcast series for our Fall Garden Tasks and part of our Fall Garden Boot Camp Challenge! 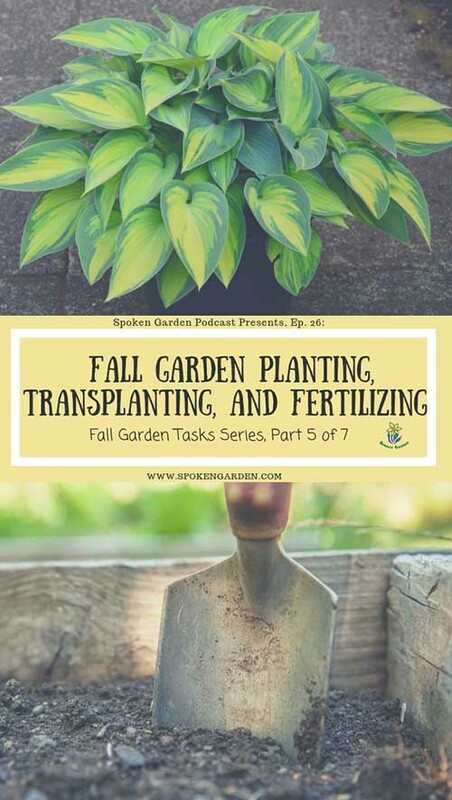 Click the graphic above to save "Fall Garden Planting, Transplanting, and Fertilizing" to Pinterest for later! Learn strategies for improving your planting and transplanting efforts this fall as well as fertilizing tips! Part 5 of our 7-part podcast series for our 8-Fall Garden Tasks and part of our Fall Garden Boot Camp Challenge! Choose to Accept Our Fall Bootcamp Challenge to get your garden ready for this fall and winter! Garden Mushrooms and What it Means. Basic planting and transplanting best practices, including how to be successful this fall. General fertilizing tips for the fall months. Why mushrooms show up in your garden and what that means about the health of your garden.